How do you add background pictures and video files to MikuMikuDance? How do you add background pictures to MikuMikuDance? How do you load video backgrounds in MMD Direct X9? Why do I get an error message whenever I load a background AVI in MMD? One of the most under-utilized features of MikuMikuDance is adding background video and pictures to the animation (Although, I’m starting to see more movies featuring up loaders dancing alongside of a model). Imagine adding Miku or any other Vocaloid to your family or vacation pictures and videos. This is something a brand new MMDer can do almost immediately after getting MikuMikuDance! MikuMikuDance will open just about any common image format except GIFs (If you try to load a GIF file, you’ll get a “cannot open BMP file” error message). First, select the picture you want to use. Copy/Paste it into your Background folder in MikuMikuDance. Go to your main menu. Click on the Background tab and select load background picture file and load your photo. If you don’t like the orientation of your photo you will have to edit the size and otherwise manipulate the image. You can use Microsoft Paint, Adobe Photoshop, or Gimp. With enough trial and error, you’ll get it to exactly how you want your background photo situated. Some advice you should first find out your screen size (it’s one of the choices under the view tab of your main menu) and use that as a starting point for your edits. 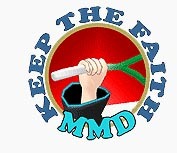 Background photos and videos are loaded dead center and MMD will not allow you to move them. Loading AVI’s to your Background. The steps for loading a background AVI (Audio Visual Interleave) are exactly the same as loading a background picture. The only difference is you choose the load background AVI file. Please note, no footage will actually show, or play, until you load a model and motion data and click play. You will not hear any audio from your AVI footage either. Please also note that AVI 1 is the only video format that MMD will play in the background. I’ll be the first to admit that this feature stumped me for the longest time. I kept getting a “Cannot open AVI” error message. This message tormented me until I downloaded and installed the Windows 7 Codec Pack from cnet.com and ffdshow from Sourceforge.net. The links for these two downloads are at the bottom of the article. I would also mention that you would choose the Codec Pack appropriate for your operating system. Whenever you load a background picture or AVI, it will always stay in the background. No matter how you change the model view or manipulate the view angle it will be locked into the background. If your animation is longer than your background footage then it will just freeze on its last frame until MikuMikuDance finishes with the motion data. You can use background video footage as a reference for your own animations. (See this article: https://learnmmd.com/http:/learnmmd.com/use-the-background-avi-to-make-realistic-animations-in-mmd-7-39/ ) You can also zoom in and out and reposition the background pictures by holding your keyboard’s control (ctrl) key and clicking on the zoom and position icons at the top right of the main display panel. I found some great fractal footage at Nosro1’s YouTube account and thought it would make some great background footage. So I made a video for our YouTube Account. Here’s the link: http://youtu.be/5NteV3ni2ZQ . You should just check out the other uploads in that account. Beautiful stuff. Models: Haku Yowane by Planty-P; MMD Default Akita Neru by Animasa. Motion Data: Candy Candy by Yamilucy. Is it possible to load an AVI video for the background and still use effects? I’ve made a MMD and I’ve realized that whenever I try to use an effect (like autoluminous) the background disappears. Most effects overwrite the background, because they cause issues if they don”t. Have you tried displaying your video on something like a keyscreen instead of trying to use the background? A keyscreen could be modified to track the camera, although I’m not sure anybody has. An alternative would be to convert your videos to APNG format and use an animated effect for the background. Something like https://www.deviantart.com/vasilnatalie/art/PostMovieDissolve-for-MMD-702883332 might do the trick for you. It is a bit sketchy! Which is why I probably wouldn’t bother writing a tutorial regarding its use– it’s not something most people would want to mess with. A much better way to handle things is through the use of video editing software like AVLUtil or Blender (yup) to combine videos. Amy Rose could use software like that too, rendering her scene without effects, black background, AVI raw, and using the alpha layer from one render to mask a video on another layer that gets blended into the with-effects render. It’s definitely a solvable problem, but one way or another, solving it will involve learning some new tools. so … I had my MMD on my old computer, spent some time and I got a new one, well, on the other computer I used to run the avi videos, now that I have this new one I do not want to run anymore, I already did everything! and nothing works … this is Windowns 10 … Could anyone help me? What exactly is that “everything” that you did, step by step? What is this “nothing” that does not work for you? Also, what *do* you want to do with your new computer? Hi! Which pack from the Windows 7 Codec Pack do I download? I honestly have no idea where to ask this, so I’m going to try here (´・ω・`). So whenever I load an AVI file (Of the correct codec), it creates a right and left transposed split screen. I haven’t seen this problem anywhere else. and it happens with every AVI file I’ve used. It works perfectly fine when I play back the video, but the second I load it into MMD, it gets messed up. You mean, you load it as a background, right? Does it happen when you load it into absolutely empty MMD screen just launched, no effects or anything? There might be some glitch in your codec’s settings. When you’re playing the video, in or outside MMD, do additional icons appear in the right corner of your taskbar? If so, you could summon codec’s properties window and see if there’s something that could cause the effect you describe. Yes, I do load it as a background with no effects, models, etc. and no icons seem to appear. I have checked the properties of the video and compared it with the information of others, and it all matches perfectly. If it means anything, I edit my videos in Corel VideoStudio Pro X6, and convert the file through that, and I got the video off of YouTube through keepvid.com. Thanks for responding so quickly before. Unfortunately, without knowing what codecs do you have installed in your system it’s hard to tell how to reach their settings and what to look for in them. I hoped that a taskbar icon would give a hint, but apparently no. You’d have to ask somebody who has a first-hand access to your computer. I’ve installed ffdshow and have had absolute confusion and no luck. A few of use worked on this for a couple hours, but all we could find is that this is a Microsoft Video 1 problem and can’t seem to be fixed due to old age of the codec. I thank you for your help, but I think this one may be uncorrectable. Is there perhaps another MMD-compatible codec that I have somehow missed? I downloaded both those things but nothing really changed. Are they video converters? Do they just add the option to converters i already have? I don’t understand what the point of those 2 downloads are. I still can’t play videos. Did you just “download” them or install them as well on your computer? These two things are codec packs (well, ffdshow is an individual codec, but oh well) used to play and encode videos. MMD is known to be rather picky about which codecs it will or will not work with, but these usually solve the problem.